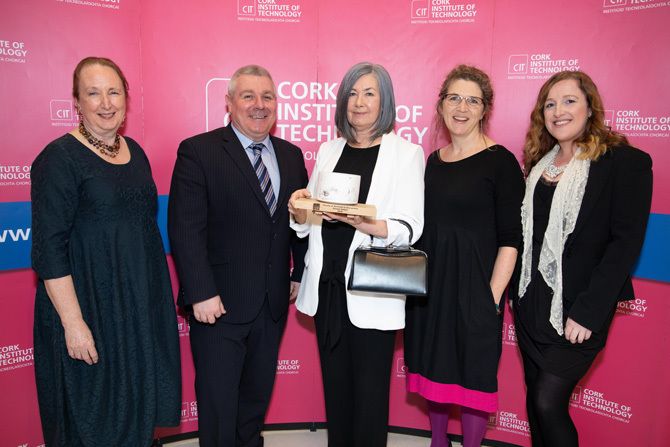 CIT’s Faculty of Business and Humanities honoured three of its most prestigious graduates at an Alumni Awards Dinner on Thursday 21st March, 2019. 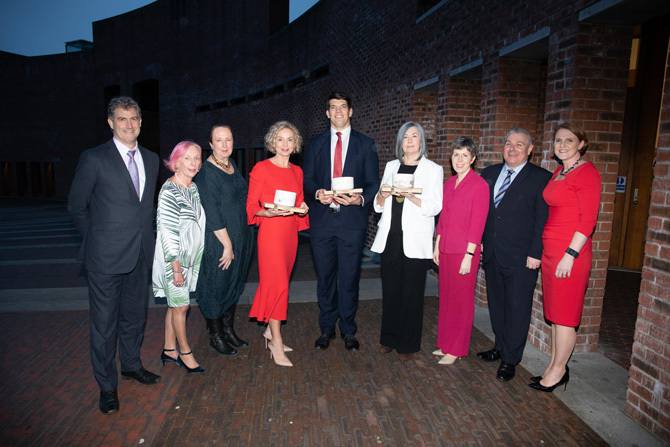 CIT celebrated Anne O’Leary, CEO, Vodafone Ireland, Donncha O’Callaghan, former Munster and Irish Rugby Player and Eilis O’Connell, Artist and presented each with an award made by CIT Crawford College of Art and Design graduate Luke Sisk. An alumni award was given to these recipients for their exceptional leadership and success in their respective fields and also for continuing to give back to students through guest lectures and attending events where they truly inspire and motivate CIT students to reach their full potential said “Gerard O’Donovan, Head of Faculty of Business and Humanities at the event. 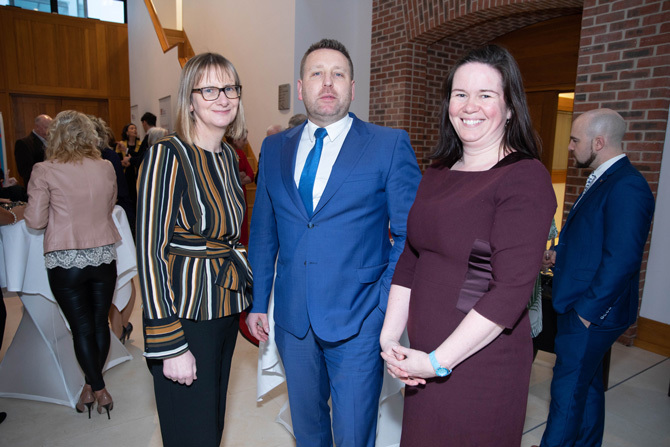 It was wonderful occasion with their citations read out by CIT staff John Myler, Cian O’Neill and Catherine Fehily who were able to add some stories and humour to the occasion. Paul Gallagher, Vice President for Finance & Administration, Prof Margaret Linehan, Head of School of Humanities; Catherine Fehily, Head of CIT Crawford College of Art and Design; Alumni Recipients Anne O’Leary, Donncha O’Callaghan and Eilis O’Connell; Dr Orla Flynn, Vice President for External Affairs, Gerard O'Donovan, Head of Faculty of Business and Humanities and Dr Breda Kenny,Head of School of Business. The awardees were joined by their family and friends on the evening and the food was served and presented by CIT’s Hospitality Management Year 2 students who impressed everyone with their culinary skills. 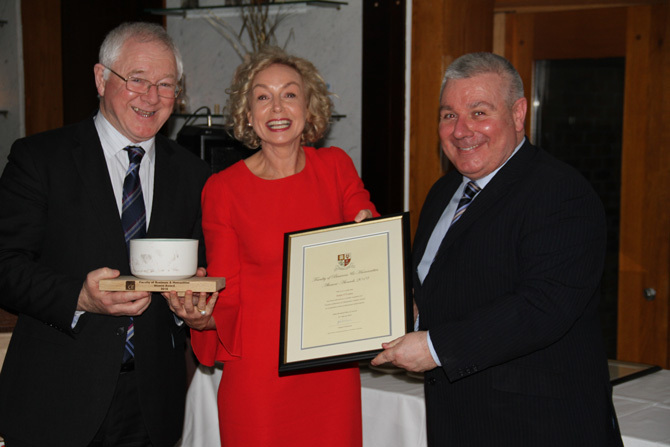 The alumni awards were presented by Dr Barry O’Connor, President of CIT who closed the night by congratulating the recipients for their well-deserved awards. Anne O’Leary was appointed CEO of Vodafone Ireland in February 2013, having spent five years as Enterprise Director. She joined Vodafone from BT Ireland where she was Managing Director for six years. Anne is the outgoing President of Dublin Chamber of Commerce and Chair of GOAL, an international aid charity committed to lifesaving humanitarian work across the globe. Anne is also an advisor to the government’s ‘Better Balance for Better Business’ Review Group. Recently, along with the Dublin and Northern Ireland Chambers of Commerce and Taoiseach Leo Varadkar, Anne visited The White House for the annual Shamrock Ceremony with the US President. As CEO of Vodafone Ireland, Anne oversees a 50:50 gender spilt at senior leadership level and is a keen advocate for making it the best employer for women by 2025. She is a champion of wellbeing and diversity and inclusion in the workplace and spearheaded Vodafone securing a position as one of Ireland’s top ten Great Places to Work. She is also the proud sponsor of the Irish Rugby team that has earned Vodafone many sponsorship & marketing awards for their #teamofus. 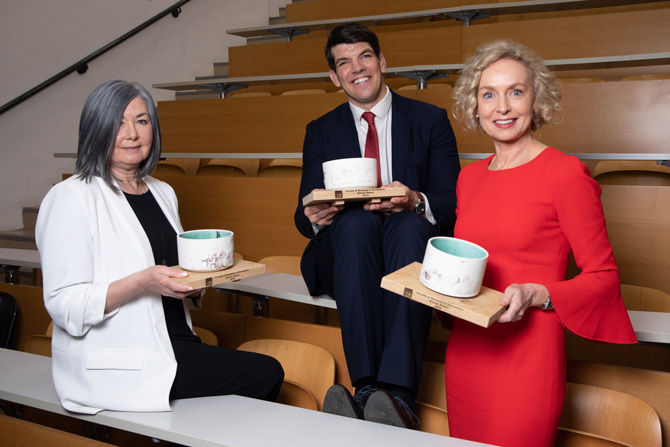 Anne has overseen Vodafone Ireland’s commitment to investing in Ireland’s telecommunications infrastructure, resulting in the nationwide rollout of 4G and high-speed fibre broadband through SIRO, Vodafone’s joint venture with the ESB. This connectivity is crucial for rural development in this digital age, with towns like Skibbereen and the Ludgate digital hub demonstrating the positive impact it has on job creation. A Cork native, Anne studied at CIT, Harvard Business School, London Business School and is a Chartered Director with the Institute of Directors Ireland. Anne is a keen athlete who enjoys swimming, cycling, running and yoga in her spare time. 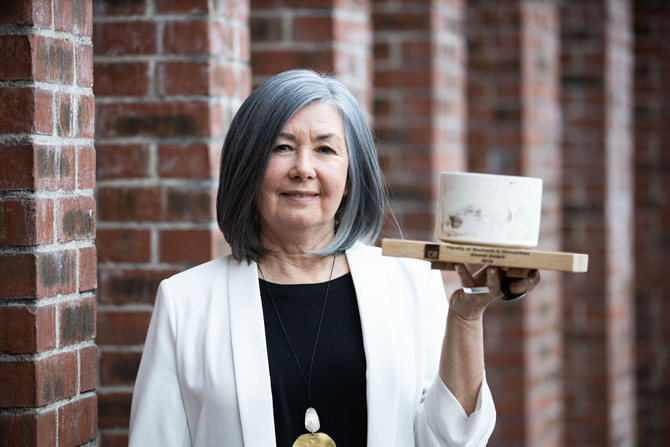 After receiving her award Anne said: “Thank you to CIT and the Faculty of Business and Humanities for this Alumni Award, I am truly honoured and grateful for the recognition. I would like to congratulate the other awardees, I am humbled to be amongst such a prestigious group. Award winning artist Eilis O' Connell was born in Derry, Northern Ireland, she studied at the Crawford School of Art, Cork and the Massachusetts College of Art Boston, U.S.A.
She held fellowships at The British School at Rome and P.S.I. in New York. A two-year residency at Delfina Studios London in 1988 resulted in her permanent move there until 2002. She returned to live in Ireland from where she exhibits internationally and works on commissions for both public and private locations. She has shown at the Venice, Paris and Sao Paolo Biennales and her small sculptures were shown at the Guggenheim Museum in Venice. In 2018 her outdoor sculptures will be shown at E1027 the home designed by Eileen Grey in Cap Martin, France. Her work can be seen in several public locations in London, Cardiff, Newcastle, Bristol, Wolverhampton, Southampton, Milton Keynes, Dublin, Belfast, Dundalk, Mallow and Cork. Other privately commissioned works can be seen at Lismore Castle in Ireland, Cass Sculpture Foundation, Chatsworth, Antony House and Doddington Park in England and other private locations in France and Spain. 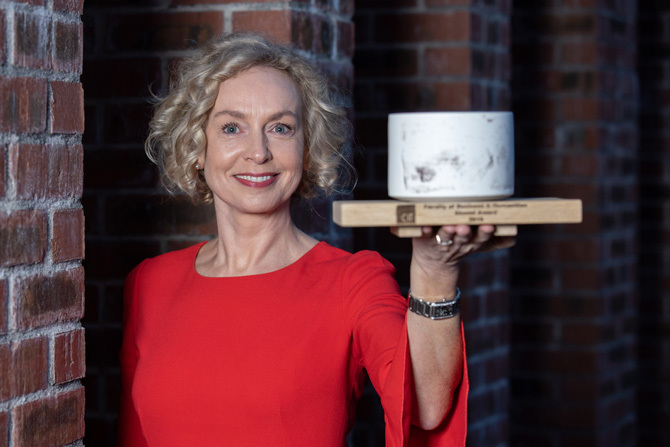 She is a founder director of the National Sculpture Factory in Cork, a former member of the Arts Council of Ireland, a member of Aosdána, and a member of the R.H.A. Donncha was born in Cork in 1979. He began playing rugby at Highfield Rugby Club before going on to play for the CBC Cork side which won the Munster Schools Senior Cup in 1998. In the same year, he played on the Ireland U19 World Championship winning side which included other future stars like Brian O'Driscoll and Paddy Wallace. First capped for Ireland in 2003, forming a formidable second row partnership with Paul O'Connell. He has won the Heineken Cup twice with Munster and has been on two tours with the British and Irish Lions, having the honour of captaining the Lions against the Southern Kings in South Africa in 2009. He was part of the Ireland team that won the Triple Crown in the 2004 Six Nations Championship, Ireland's first Triple Crown in 19 years. In all he has played 506 professional matches, 94 Ireland caps, four Lions appearances, two for the Barbarians, 58 games for Worcester and has the top appearance of 268 with Munster Rugby. He was one of Ireland’s leading international rugby players, and a stalwart of the Munster side. 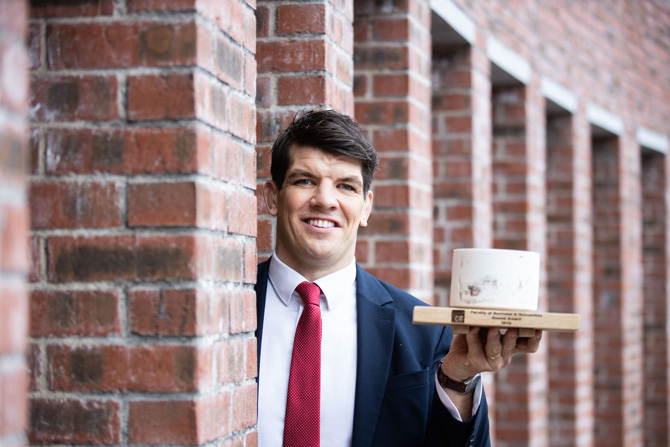 After 20 years as a professional, Donncha O'Callaghan retired as a rugby player in April 2018. O'Callaghan has been an Ambassador for UNICEF Ireland since July 2009 and has made visits to South Africa, Haiti, Zimbabwe, Lebanon, and Syria with UNICEF. Donncha resides in Cork with his wife Jennifer and 4 children, Sophie, Anna, Robin and Jake. 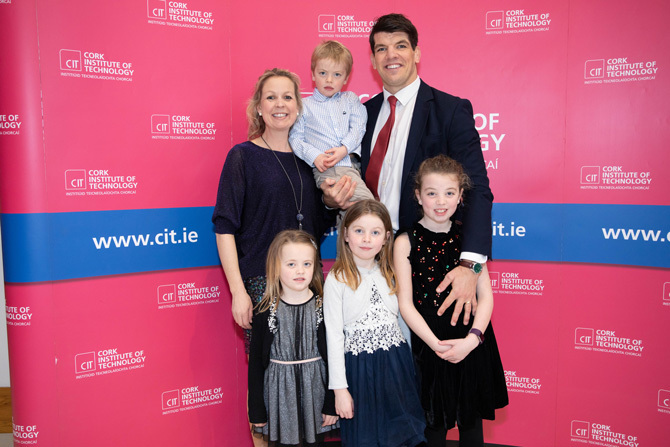 Donnacha O’ Callaghan, Alumni Award Recipient with his wife Jennifer and children Anna, Sophie, Jake and Robin. 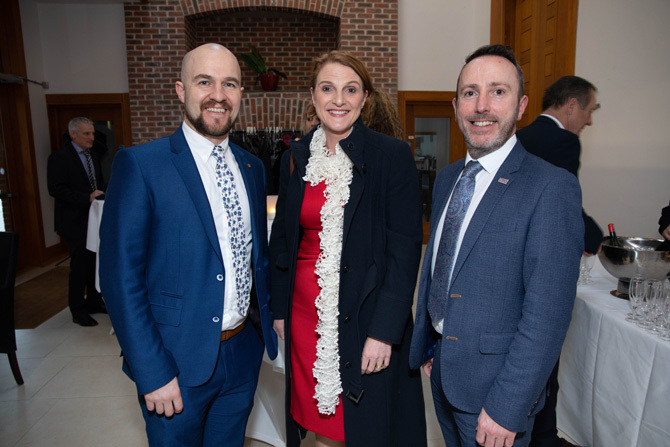 Caroline O’Reilly, Head of Department of Management and Enterprise, Dr Cian O’Neill, Head of Department of Sport, Leisure and Childhood Studies and Dr Catherine Molyneaux, Head of Department of Applied Social Studies, CIT.